This article deals with a 3D printing strategy to reduce supports in the case of overhang geometry on 3D printed models realized by Fused Filament Fabrication (FFF). Experiments were performed to compare the conventional FFF process (normal orientation to the platform) with a novel strategy of 3D printing using 6-axis degrees of freedom to orient the nozzle close to the tangent direction of the 3D printed wall. 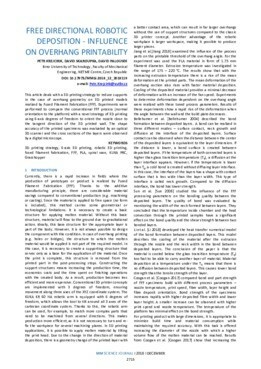 The shape accuracy of the printed specimens was evaluated by an optical 3D scanner and the cross sections of the layers were observed by a digital microscope.